I live in a rural area and am not close to any of the in-person support groups for this type of prenatal loss. My husband and I decided to end our pregnancy seven months ago after learning our baby had severe issues due to Amniotic Band Syndrome. I tried several times to sign up for a Yahoo listserv that was featured prominently on the A Heartbreaking Choice® website but got absolutely no response. I’m still struggling with our decision almost daily. I just need to talk to someone who has been there. I do have a counselor and she helps me with my grief, but it’s not like I miscarried spontaneously. This is just so different from other prenatal losses. I don’t know where to turn next. How do you deal with this? Where can I find support? I live in a rural area and am not close to any of the in-person support groups for this type of prenatal loss. Can you recommend any online support groups, books or other resources? I’m so sorry about your loss, and that you feel alone in this. I agree that miscarriage support groups tend to miss the mark for those of us who’ve made the decision to terminate a pregnancy for medical reasons. Those who were never faced with a decision in their loss rarely get it. You need to be able to talk to people who have shared this path and understand what it’s like. I share your frustration with the site that prominently features the defunct Yahoo listserv. Links to blind alleys like that one offer nothing but false hope and disappointment. A grief support website should be kept up-to-date to serve those who are grieving today. The one you’re referring to also lacks SSL security certification (the lock in the address bar) and has been inundated with gamer spam. We fear it’s become genuinely unsafe. We provide a modern platform for parent-to-parent grief support, a private, moderated group that is currently running on Facebook. 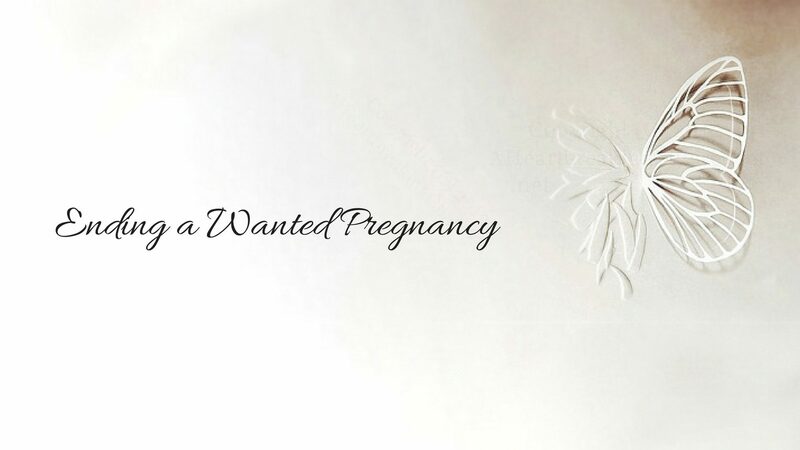 It’s exclusively for parents like you, who have ended a wanted pregnancy following a poor prenatal or maternal diagnosis. There you will find lots of support from people who have been there. We welcome parents at any stage in the grief process, from pre-termination (as long as the decision to end the pregnancy has already been made) to many years past their loss. Our group even includes older members from that defunct Yahoo listserv (and also our old Yuku forums, which were active from early 2005 to early 2015) who’ve joined us to support the newly bereaved via our private Facebook group. You can learn more about our grief community by reading our Support Group FAQ. We hope you’ll consider joining us. We maintain a list of books on grief and prenatal loss which you may find helpful. We also keep an up-to-date list of support sites, counselors and groups, including some trusted support groups that are alternatives to our own. We’re here for you and we will never send you off to join a defunct Yahoo listserv or deserted forum. A Heartbreaking Choice® is a Registered Trademark of Coleen G. Holley. It used to be a support website but has since been downgraded to a link farm for gamer spam.